I have been in search of an allergy safe brand of Flax seed. I thought maybe Bob’s Red Mill would be a good product. Manufactured in a facility that also uses tree nuts and soy, which are allergens for my nephew. There were a few other brands that I came across however found the same warning information on their labels. I finally came across Hodgson Mill’s brand, there was no mention on the label as to whether or not it is processed in a dedicated allergy safe facility, not sure if that is a good or bad thing? They follow extensive and systematic procedures to ensure that the products they produce are as safe as possible, and take great measures to minimize the risk of mixing between possible allergic food or ingredients during production. I’m not exactly sure how this applies to the flax seed that they process? Flax is being noted as a powerful plant that is linked to reducing the risk of heart disease, cancer, stroke, diabetes and there is some information that it could be linked to possibly helping with eczema. A few of the healthy components are; omega 3 essential fatty acids, lignans, fiber. Click for more information about the benefits of milled flaxseed. I add flax in to all kinds of food; in my cereal, most bread/cookie recipes, and smoothies. At the time of writing this my nephew still nurses as his primary source of nutrition. He is a very picky eater, maybe due to the allergies; his favorite food are a packet of bananas and rice baby food and rice Chex, he is very skeptical of food. I started juicing and making smoothies a couple months ago for my nephew and he loves that, it is a great chance to sneak new foods in him that he wouldn't normally eat. I even got him to try avocado which I blended in a banana avocado smoothie,and he liked it. One day I decided to add some milled flax seed into the smoothie. Within 30 mins (unfortunately in the car on the way to the store) he started to vomit. Food Allergy Symptom: Allergic Reaction to Flax or an ingredient from the processing of the flax. The flax may have possibly been processed in a facility that processes some of his allergens (the flax I used that day doesn’t state this information on the label). He has had flax oil in a smoothie before and showed no reaction, however that is how he was with coconut oil as well. It worked well the first time then the second time he turned really red and got welts, we later found out he was allergic to coconut. It's hard to say if this will be the same for flax seed or if maybe it was contaminated? 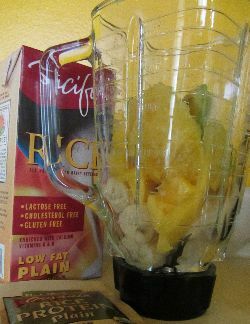 I have been reading about people having flax seed allergies so that is a possibility that I will consider, I may just leave flax out of smoothie recipes for now. This got me thinking about what are the guidelines on food labels, can I trust them. As it is I read every single label on everything I buy at the store to make sure it doesn’t contain any of his allergens, but am I missing something? Just because a product doesn’t include common food allergies does that mean it is safe? Do they process other products that contain that allergy? How do they prevent cross contamination, and do they have to state that on the label? Click here to read more on labels.